Directly in front of the impressive colonnade of the church of San Francesco di Paola at Piazza Plebiscito are the two most visible statues in Naples. As you face the church, the one on the southern (left) side (photo, left) is of Charles III of Bourbon, the founding father of the Bourbon dynasty in Naples; on the right (photo, below) is his son, Ferdinand IV of Naples (later named Ferdinand I of the Kingdom of the Two Sicilies). The son commissioned his father’s statue in 1818, shortly after the Bourbons came back into possession of their kingdom after the Napoleonic wars. (The first thing they did, of course, was finish the church, itself, in 1816. See that link above.) The sculptor was Antonio Canova (1757-1822), a northern Italian and one of the most famous sculptors of his age. Actually, son Ferdinand only reconfirmed the original commission to Canova given by Joseph Bonaparte in 1807 during the French reign in Naples. It was finished in 1819 and placed in the square in 1829. The monarch is garbed in classical Roman fashion. Ferdinand also commissioned the statue to himself at the same time. He is, like his father, mounted and dressed in classical fashion. The sculptor was also Canova, but he died and the work was completed by the Neapolitan, Antonio Calì (1788-1866). The entire project of statues in the square was not one of Canova’s favorites. He apparently accepted the original French commission when the plan was to dedicate the work to the then Emperor Napoleon. (The church, itself, was originally meant to be a pantheon-like tribute to Napoleon.) After the restoration of the monarchy, Ferdinand called Canova to Naples to discuss finishing the work. Canova complained to a friend that he had undertaken a long trip to discuss something that just as easily could have been discussed by letter. Perhaps after his Psyche Revived by Love’s Kiss—now in the Louvre—and Perseus and the Head of Medusa—in the Vatican museum—not to mention a bust of Napoleon, himself, a second-rate King sitting on a horse didn’t quite get his 61-year-old juices flowing anymore. (I mean, of course, Ferdinand—a total dud. His father, Charles III was brilliant and, perhaps the last of the great “benevolent monarchs” in the age of Absolutism in Europe.) Ferdinand got Canova to agree to do the second statue, but Canova pleaded “no time” when the king tried to get a third statue out of him—of Lucia Migliaccio, the king’s second and “morganatic” wife. 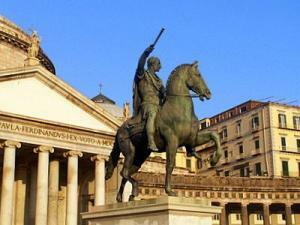 Both statues were threatened by a mob in the wake of Garibaldi’s entry into Naples in 1860. Fortunately—I think—a revolutionary priest, father Gavazzi, jumped up on one of the statues and stayed the frenzied wrecking crew by saying that they should save the statues because they could then replace the two heads of the monarchs with those of Garibaldi and Victor Emanuel (eventually the first king of the new, united Italy). I don’t know what became of that plan, but at least it calmed the crowd.